The painters, who were either slaves or craftsmen paid as pottery painters, worked on unfired, leather-dry vases. 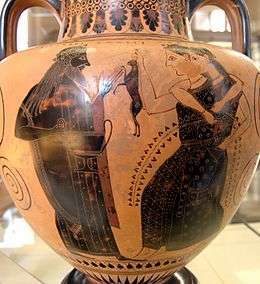 In the case of black-figure production the subject was painted on the vase with a clay slurry (a glossy slip, in older literature also designated as varnish) which turned black after firing. This was not a "color" in the traditional sense, since this surface slip was of the same material as the vase itself, only differing in the size of the component particles. The area for the figures was first painted with a brush-like implement. The internal outlines and structural details were incised into the slip so that the underlying clay could be seen through the scratches. Two other earth-based pigments were used to add details—red and white for ornaments, clothing or parts of clothing, hair, animal manes, parts of weapons and other equipment. White was also frequently used to represent women’s skin. 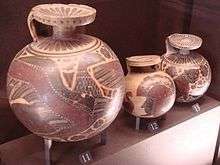 The success of all this effort could only be judged after a complicated, three-phase firing process which generated the red color of the vase clay and the black of the applied slip. Specifically, the vessel was fired in a kiln at a temperature of about 800 °C, with the resultant oxidization turning the vase a reddish-orange color. The temperature was then raised to about 950 °C with the kiln's vents closed and green wood added to remove the oxygen. The vessel then turned an overall black. The final stage required the vents to be re-opened to allow oxygen into the kiln, which was allowed to cool down. The vessel then returned to its reddish-orange colour due to renewed oxidization, while the now-sintered painted layer remained the glossy black color which had been created in the second stage. 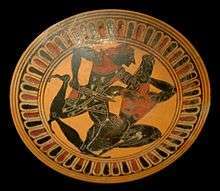 The Pholoe Painter is well known, his most famous work being a skyphos with a picture of Heracles. The Dodwell Painter continued to paint animal friezes, although other painters had already given up this tradition. His creative period extended into Late-Corinthian times and his influence cannot be overestimated on vase painting of that time. 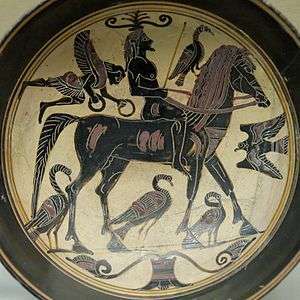 Likewise of exceptional reputation were the master of the Gorgoneion Group and the Cavalcade Painter, given this designation because of his preference for depicting horsemen on cup interiors; he was active around 580 BC. 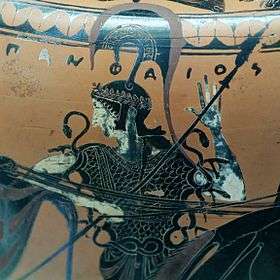 Two of his masterpieces are a cup showing the suicide of Ajax, and a column krater showing a bridal couple in a chariot. All figures shown on the bowl are labeled. 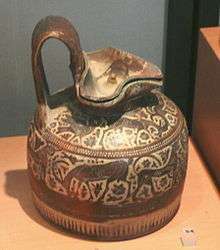 The first artist known by name is the polychrome vase painter Timonidas, who signed a flask and a pinax. 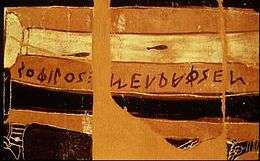 A second artist’s name of Milonidas also appears on a pinax. The Corinthian olpe was replaced by an Attic version of the oinochoe with a cloverleaf lip. In Middle Corinthian time, depictions of people again became more common. 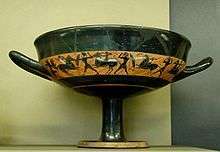 The Eurytios krater dated around 600 BC is considered to be of particularly high quality; it shows a symposium in the main frieze with Heracles, Eurytios, and other mythical figures. In Late Corinthian times (sometimes designated Late Corinthian I, 575-550 BC) Corinthian vases had a red coating to enhance the contrast between the large white areas and the rather pale color of the clay vessel. This put the Corinthian craftsmen in competition with Attic pottery painters, who had in the meantime taken over a leading role in the pottery trade. Attic vase forms were also increasingly copied. 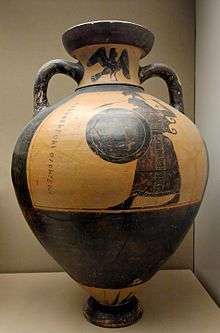 Oinochoes, whose form had remained basically unchanged up until that time, began to resemble Attic forms; lekythos also started to be increasingly produced. The column krater, a Corinthian invention which was for that reason called a korinthios in the rest of Greece, was modified. Shortening the volutes above the handles gave rise to the Chalcidic krater. The main image field it was decorated with various representations of daily life or mythological scenes, the secondary field contained an animal frieze. The back often showed two large animals. Cups had become deeper already in Mid-Corinthian times and this trend continued. They became just as popular as kotyles. Many of them have mythological scenes on the outside and a gorgon grimace on the inside. This type of painting was also adopted by Attic painters. On their part, Corinthian painters took over framed image fields from Athens. Animal friezes became less important. During this time the third Corinthian painter with a known name, Chares, was active. 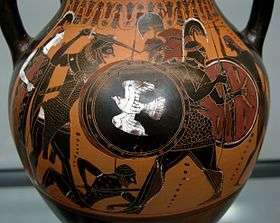 The Tydeus Painter should also be mentioned, who around 560 BC liked to paint neck amphoras with a red background. Incised rosettes continued to be put on vases; they are lacking on only a few kraters and cups. 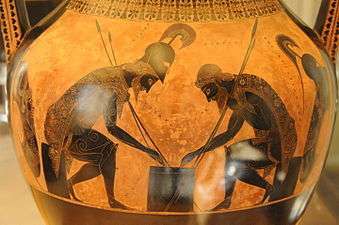 The most outstanding piece of art in this period is the Amphiaraos krater, a column krater created around 560 BC as the major work of the Amphiaraos Painter. It shows several events from the life of the hero Amphiaraos. In addition to following Corinthian models, Athens vases also showed local innovations. 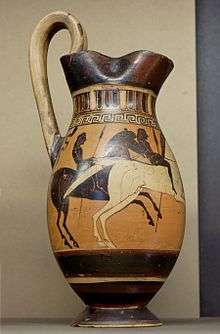 Thus at the beginning of the 6th century BC a "Deianaira type" of lekythos arose, with an elongated, oval form. 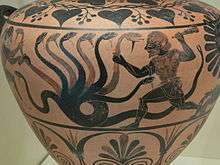 The most important painter of this early time was the Gorgon Painter (600-580 BC). He was a very productive artist who seldom made use of mythological themes or human figures, and when he did, always accompanied them with animals or animal friezes. 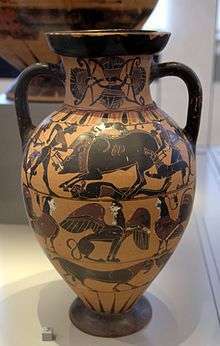 Some of his other vases had only animal representations, as was the case with many Corinthian vases. Besides the Gorgon Painter the painters of the Komast Group (585-570 BC) should be mentioned. 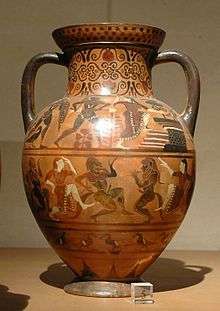 This group decorated types of vases which were new to Athens, namely lekanes, kotyles and kothons. The most important innovation was however the introduction of the komast cup, which along with the "prekomast cups" of the Oxford Palmette Class stands at the beginning of the development of Attic cups. Important painters in this group were the elder KX Painter and the somewhat less talented KY Painter, who introduced the column krater to Athens. 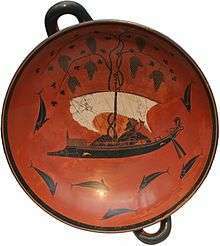 These vessels were designed for use at banquets and were thus decorated with relevant komos scenes, such as komast performers komos scenes. Other significant painters of the first generation were the Panther Painter, the Anagyrus Painter, the Painter of the Dresden Lekanis and the Polos Painter. 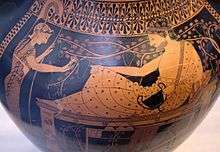 The last significant representative of the first generation of painters was Sophilos (580–570 BC), who is the first Attic vase painter known by name. 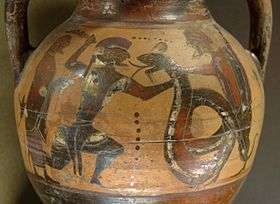 In all, he signed four surviving vases, three as painter and one as potter, revealing that at this date potters were also painters of vases in the black-figure style. A fundamental separation of both crafts seems to have occurred only in the course of the development of the red-figure style, although prior specialization cannot be ruled out. Sophilos makes liberal use of annotations. He apparently specialized in large vases, since especially dinos and amphoras are known to be his work. Much more frequently than his predecessors, Sophilos shows mythological scenes like the funeral games for Patroclus. The decline of the animal frieze begins with him, and plant and other ornaments are also of lower quality since they are regarded as less important and thus receive scant attention from the painter. But in other respects Sophilos shows that he was an ambitious artist. On two dinos the marriage of Peleus and Thetis is depicted. These vases were produced at about the same time as the François vase, which depicts this subject to perfection. However, Sophilos does without any trimmings in the form of animal friezes on one of his two dinos, and he does not combine different myths in scenes distributed over various vase surfaces. 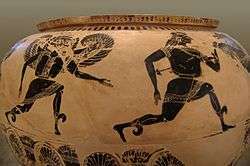 It is the first large Greek vase showing a single myth in several interrelated segments. A special feature of the dinos is the painter’s application of the opaque white paint designating women directly on the clay foundation, and not as usual on the black gloss. The figure’s interior details and contours are painted in a dull red. This particular technique is rare, only found in vases painted in Sophilos’ workshop and on wooden panels painted in the Corinthian style in the 6th century BC. Sophilos also painted one of the rare chalices (a variety of goblet) and created the first surviving series of votive tablets. He himself or one of his successors also decorated the first marriage vase (known as a lebes gamikos) to be found. 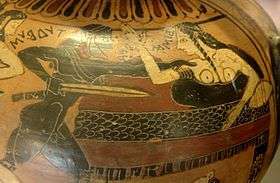 The first important painter of this time was the Amasis Painter (560–525 BC), named after the famous potter Amasis, with whom he primarily worked. Many researchers regard them as the same person. He began his painting career at about the same time as Lydos but was active over a period almost twice as long. Whereas Lydos showed more the abilities of a skilled craftsman, the Amasis Painter was an accomplished artist. His images are clever, charming and sophisticated and his personal artistic development comes close to a reflection of the overall evolution of black-figure Attic vase painting at that time. His early work shows his affinity to the painters of Siana cups. Advances can be most easily recognized in how he draws the folds of clothing. His early female figures wear clothes without folds. Later he paints flat, angular folds, and in the end he is able to convey the impression of supple, flowing garments. Drawings of garments were one of his chief characteristics; he liked to depicted pattered and fringed clothing. The groups of figures which the Amasis Painter shows were carefully drawn and symmetrically composed. Initially they were quite static, later figures convey an impression of motion. 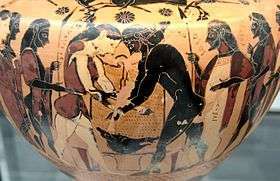 Although the Amasis Painter often depicted mythological events—he is known for his pig-faced satyrs, for example—he is better known for his scenes of daily life. He was the first painter to portray them to a significant extent. His work decisively influenced the work of red-figure painters later. He possibly anticipated some of their innovations or was influenced by them toward the end of his painting career: on many of his vases women are only shown in outline, without a black filling, and they are no longer identifiable as women by the application of opaque white as skin color. 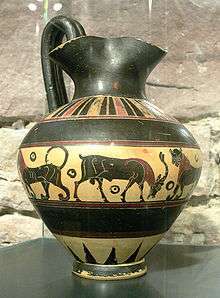 Schwarz-figure vases were produced in Boeotia from the 6th to the 4th century BC. As late as the early 6th century BC many Boeotian painters were using the orientalizing outline technique. Afterward they oriented themselves closely on Attic production. Distinctions and attributions to one of the two regions are sometimes difficult and the vases can also be confused with Corinthian pottery. Low-quality Attic and Corinthian vases are often declared to be Boeotian works. 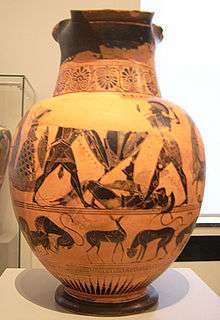 Frequently, good Boeotian vases are considered to be Attic and poor Attic vases are falsely considered to be Boeotian. There was probably an exchange of craftsmen with Attica. 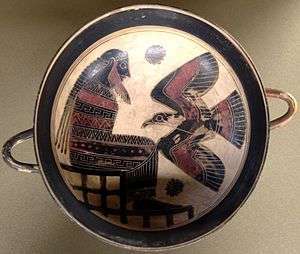 In at least one case it is certain that an Attic potter emigrated to Boeotia (the Horse-Bird Painter, and possibly also the Tokra Painter, and among the potters certainly Teisias the Athenian). The most important subjects are animal friezes, symposia and komos scenes. Mythological scenes are rare, and when present usually show Heracles or Theseus. From the late 6th century through the 5th century a silhouette-like style predominated. Especially kantharos, lekanis, cups, plates and pitchers were painted. As was the case in Athens, there are kalos inscriptions. Boeotian potters especially liked to produce molded vases, as well as kantharos with sculptured additions and tripod pyxides. 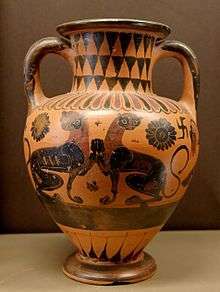 The shapes of lekanis, cups and neck amphoras were also taken over from Athens. The painting style is often humorous, and there is a preference for komos scenes and satyrs. ↑ On vase production and style see Ingeborg Scheibler: Griechische Töpferkunst. München 1995, S. 73–134; Matthias Steinhart: Töpferkunst und Meisterzeichnung, von Zabern, Mainz 1996, S. 14–17; Heide Mommsen, Matthias Steinhart: Schwarzfigurige Vasenmalerei. In: Der Neue Pauly (DNP). Band 12, Metzler, Stuttgart 1996–2003, ISBN 3-476-01470-3, Sp. 274–281. ↑ On Corinthian vase paintings see Thomas Mannack: Griechische Vasenmalerei, Theiss, Stuttgart 2002, S. 100–104; Matthias Steinhart: Korinthische Vasenmalerei. In: Der Neue Pauly (DNP). Band 6, Metzler, Stuttgart 1999, ISBN 3-476-01476-2, Sp. 738–742. 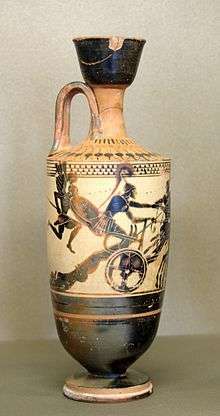 ; John Boardman: Early Greek Vase Painting, Thames and Hudson, London 1998, S. 178–185. .
↑ Chronologies vary somewhat. In Matthias Steinhart: Korinthische Vasenmalerei. In: Der Neue Pauly (DNP). Band 6, Metzler, Stuttgart 1999, ISBN 3-476-01476-2, Sp. 738–742 the following is given: Early Corinthian (620/615–595 BC), Middle Corinthian (595–570 BC), Late Corinthian I (570–550 BC), and Late Corinthian II (after 550 BC). ↑ On the Dodwell Painter, see Matthias Steinhart: Dodwell-Maler. In: Der Neue Pauly (DNP). Band 3, Metzler, Stuttgart 1997, ISBN 3-476-01473-8, Sp. 726–727. ↑ On the Cavalcade Painter, see Matthias Steinhart: Kavalkade-Maler. In: Der Neue Pauly (DNP). Band 6, Metzler, Stuttgart 1999, ISBN 3-476-01476-2, Sp. 370–371. ↑ On Tomonidas see Matthias Steinhart: Timonidas. In: Der Neue Pauly (DNP). Band 12/1, Metzler, Stuttgart 2002, ISBN 3-476-01482-7, Sp. 594–594. ↑ Now in the Berlin Collection of Classical Antiquities, Altes Museum. ↑ On Chares see Matthias Steinhart: Chares . In: Der Neue Pauly (DNP). Band 2, Metzler, Stuttgart 1997, ISBN 3-476-01472-X, Sp. 1099–1099. ↑ On the Tydeus Painter see Matthias Steinhart: Tydeus-Maler. In: Der Neue Pauly (DNP). Band 2, Metzler, Stuttgart 1997, ISBN 3-476-01472-X, Sp. 939–940. ↑ John Boardman: Schwarzfigurige Vasen aus Athen, von Zabern, Mainz 1979, S. 7. ↑ Heide Mommsen: Schwarzfigurige Vasenmalerei. In: Der Neue Pauly (DNP). Band 12, Metzler, Stuttgart 1996–2003, ISBN 3-476-01470-3, Sp. 274–281. ↑ Thomas Mannack: Griechische Vasenmalerei, Theiss, Stuttgart 2002, S. 104. ↑ Fragment in Leipzig, found in Cerveteri, with gorgons on the belly as on the Nessos vase. ↑ Thomas Mannack: Griechische Vasenmalerei, Theiss, Stuttgart 2002, S. 105; John Boardman: Schwarzfigurige Vasen aus Athen, von Zabern, Mainz 1979, S. 18f. ↑ John Boardman: Schwarzfigurige Vasen aus Athen, von Zabern, Mainz 1979, S. 20. ↑ Found on the Akropolis in Athens, now in the Akropolis Museum, inventory number 587. ↑ John Boardman: Schwarzfigurige Vasen aus Athen, von Zabern, Mainz 1979, S. 21. ↑ Thomas Mannack: Griechische Vasenmalerei, Theiss, Stuttgart 2002, S. 111. ↑ on the François vase see John Boardman: Schwarzfigurige Vasen aus Athen, von Zabern, Mainz 1979, S. 37f. und Thomas Mannack: Griechische Vasenmalerei, Theiss, Stuttgart 2002, S. 111f. ↑ Thomas Mannack: Griechische Vasenmalerei, Theiss, Stuttgart 2002, S. 113. ↑ On Lydos see John Boardman: Schwarzfigurige Vasen aus Athen, von Zabern, Mainz 1979, S. 57–58, Thomas Mannack: Griechische Vasenmalerei, Theiss, Stuttgart 2002, S. 113. ↑ John Boardman: Schwarzfigurige Vasen aus Athen, von Zabern, Mainz 1979, S. 57. ↑ John Boardman: Schwarzfigurige Vasen aus Athen, von Zabern, Mainz 1979, S. 60. ↑ John Boardman: Schwarzfigurige Vasen aus Athen, von Zabern, Mainz 1979, S. 61. ↑ On the Amasis Painter see John Boardman: Schwarzfigurige Vasen aus Athen, von Zabern, Mainz 1979, S. 60–62; Thomas Mannack: Griechische Vasenmalerei, Theiss, Stuttgart 2002, S. 120. ↑ Quote translated from John Boardman: Schwarzfigurige Vasen aus Athen, von Zabern, Mainz 1979, S. 62. On Group E see John Boardman: Schwarzfigurige Vasen aus Athen, von Zabern, Mainz 1979, S. 62 und Thomas Mannack: Griechische Vasenmalerei, Theiss, Stuttgart 2002, S. 120. ↑ For an assessment see, for example, John Boardman: Schwarzfigurige Vasen aus Athen, von Zabern, Mainz 1979, S. 62. ↑ Now in the Munich State Collection of Antiquities, inventory number 2044. ↑ Now in the Boulogne Museum, inventory number 558. ↑ On Exekias see John Boardman: Schwarzfigurige Vasen aus Athen, von Zabern, Mainz 1979, S. 63f. and Thomas Mannack: Griechische Vasenmalerei, Theiss, Stuttgart 2002, S. 121–123. ↑ Back-translated from John Boardman: Schwarzfigurige Vasen aus Athen, von Zabern, Mainz 1979, S. 64. ↑ John Boardman: Schwarzfigurige Vasen aus Athen, von Zabern, Mainz 1979, S. 64. ↑ On votive tablets see Heide Mommsen: „Bleib stehn und erhebe die Klage...". Zu den wiedervereinigten Fragmenten der Grabtafeln des Exekias, in EOS 12 (August 2000), S. IV-VII. and also: Exekias I. Die Grabtafeln, von Zabern, Mainz 1997 (Forschungen zur antiken Keramik. Reihe 2, Kerameus, Bd. 11) ISBN 3-8053-2033-7. ↑ On the Gordion cup see John Boardman: Schwarzfigurige Vasen aus Athen, von Zabern, Mainz 1979, S. 65; Thomas Mannack: Griechische Vasenmalerei, Theiss, Stuttgart 2002, S. 118. ↑ On lip cups see John Boardman: Schwarzfigurige Vasen aus Athen, von Zabern, Mainz 1979, S. 65–67; Thomas Mannack: Griechische Vasenmalerei, Theiss, Stuttgart 2002, S. 118. ↑ On band cups see John Boardman: Schwarzfigurige Vasen aus Athen, von Zabern, Mainz 1979, S. 66f. ; Thomas Mannack: Griechische Vasenmalerei, Theiss, Stuttgart 2002, S. 118. ↑ On Droop cups see John Boardman: Schwarzfigurige Vasen aus Athen, von Zabern, Mainz 1979, S. 68f. ; Thomas Mannack: Griechische Vasenmalerei, Theiss, Stuttgart 2002, S. 119. ↑ On Kassel cups see John Boardman: Schwarzfigurige Vasen aus Athen, von Zabern, Mainz 1979, S. 69; Thomas Mannack: Griechische Vasenmalerei, Theiss, Stuttgart 2002, S. 119. ↑ On the Hermogenes Skyphos see John Boardman: Schwarzfigurige Vasen aus Athen, von Zabern, Mainz 1979, S. 69. ↑ John Boardman: Schwarzfigurige Vasen aus Athen, von Zabern, Mainz 1979, S. 73. ↑ On Nikosthenes’ workshop see John Boardman: Schwarzfigurige Vasen aus Athen, von Zabern, Mainz 1979, S. 71–73, Thomas Mannack: Griechische Vasenmalerei, Theiss, Stuttgart 2002, S. 123f. ↑ On Elbows Out and The Affecter see John Boardman: Schwarzfigurige Vasen aus Athen, von Zabern, Mainz 1979, S. 73f., Thomas Mannack: Griechische Vasenmalerei, Theiss, Stuttgart 2002, S. 124. ↑ On the Antimenes Painter see John Boardman: Schwarzfigurige Vasen aus Athen, von Zabern, Mainz 1979, S. 119f. ; Thomas Mannack: Griechische Vasenmalerei, Theiss, Stuttgart 2002, S. 124. ↑ On Psiax siehe John Boardman: Schwarzfigurige Vasen aus Athen, von Zabern, Mainz 1979, S. 115; Thomas Mannack: Griechische Vasenmalerei, Theiss, Stuttgart 2002, S. 124. ↑ On the Leagros Group see John Boardman: Schwarzfigurige Vasen aus Athen, von Zabern, Mainz 1979, S. 120f. ; Thomas Mannack: Griechische Vasenmalerei, Theiss, Stuttgart 2002, S. 124. ↑ On the painters of the Leagros Group see John Boardman: Schwarzfigurige Vasen aus Athen, von Zabern, Mainz 1979, S. 121f. ↑ On the Swing Painter see John Boardman: Schwarzfigurige Vasen aus Athen, von Zabern, Mainz 1979, S. 71. ↑ On the Rycroft Painter see Heide Mommsen: Rycroft-Maler. In: Der Neue Pauly (DNP). Band 10, Metzler, Stuttgart 2001, ISBN 3-476-01480-0, Sp. 1174–1174., John Boardman: Schwarzfigurige Vasen aus Athen, von Zabern, Mainz 1979, S. 124. ↑ On the bilingual style see John Boardman: Schwarzfigurige Vasen aus Athen, von Zabern, Mainz 1979, S. 124f. ↑ On these late painters see siehe Boardman op. cit. p. 158–164; Thomas Mannack: Griechische Vasenmalerei, Theiss, Stuttgart 2002, S. 125. ↑ For the statistics see Thomas Mannack: Griechische Vasenmalerei, Theiss, Stuttgart 2002, S. 114. ↑ On the Panathenaic prize amphoras see John Boardman: Schwarzfigurige Vasen aus Athen, von Zabern, Mainz 1979, S. 180–183; Thomas Mannack: Griechische Vasenmalerei, Theiss, Stuttgart 2002, S. 113–117. ↑ Now in the British Museum London, inventory number B1. ↑ Found in Vulci, now with the inventory number 189 in the Paris Cabinet des Médailles de la Bibliothèque Nationale de France. ↑ On Boeotian pottery see Thomas Mannack: Griechische Vasenmalerei, Theiss, Stuttgart 2002, S. 128f. ; Matthias Steinhart: Schwarzfigurige Vasenmalerei II. Ausserattisch. In: Der Neue Pauly (DNP). Band 11, Metzler, Stuttgart 2001, ISBN 3-476-01481-9, Sp. 276–281., John Boardman: Early Greek Vase Painting, Thames and Hudson, London 1998 pp. 213–215. ↑ On Boeotian pottery see Thomas Mannack: Griechische Vasenmalerei, Theiss, Stuttgart 2002, S. 129; Matthias Steinhart: Schwarzfigurige Vasenmalerei II. Ausserattisch. In: Der Neue Pauly (DNP). Band 11, Metzler, Stuttgart 2001, ISBN 3-476-01481-9, Sp. 277–277., John Boardman: Early Greek Vase Painting, Thames and Hudson, London 1998, p. 258. ↑ John Boardman: Early Greek Vase Painting, Thames and Hudson, London 1998, p. 215f. ; Matthias Steinhart: Schwarzfigurige Vasenmalerei II. Ausserattisch. In: Der Neue Pauly (DNP). Band 11, Metzler, Stuttgart 2001, ISBN 3-476-01481-9, Sp. 276–281. ↑ On Ionian pottery see Thomas Mannack: Griechische Vasenmalerei, Theiss, Stuttgart 2002, S. 81f. ; Matthias Steinhart: Schwarzfigurige Vasenmalerei II. Ausserattisch. In: Der Neue Pauly (DNP). Band 11, Metzler, Stuttgart 2001, ISBN 3-476-01481-9, Sp. 276–281. 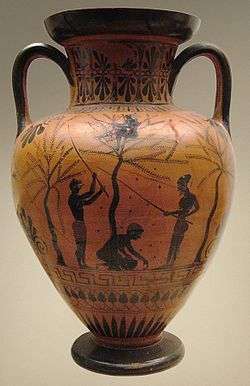 ; John Boardman: Early Greek Vase Painting, Thames and Hudson, London 1998, pp. 141–151. ↑ On Klazomenian pottery painting see Thomas Mannack: Griechische Vasenmalerei, Theiss, Stuttgart 2002, S. 81f. ; Matthias Steinhart: Schwarzfigurige Vasenmalerei II. Ausserattisch. In: Der Neue Pauly (DNP). Band 11, Metzler, Stuttgart 2001, ISBN 3-476-01481-9, Sp. 276–281. ; John Boardman: Early Greek Vase Painting, Thames and Hudson, London 1998, p. 148f. 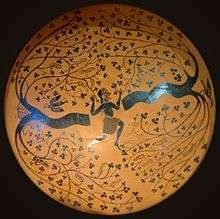 ↑ On Samian pottery painting see Thomas Mannack: Griechische Vasenmalerei, Theiss, Stuttgart 2002, S. 81f. ; Matthias Steinhart: Schwarzfigurige Vasenmalerei II. Ausserattisch. In: Der Neue Pauly (DNP). Band 11, Metzler, Stuttgart 2001, ISBN 3-476-01481-9, Sp. 276–281. ; John Boardman: Early Greek Vase Painting, Thames and Hudson, London 1998, p. 146f. 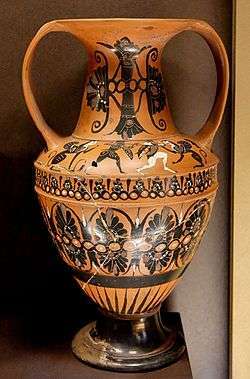 ↑ On Rhodian vase painting see Thomas Mannack: Griechische Vasenmalerei, Theiss, Stuttgart 2002, S. 81f. ; Matthias Steinhart: Schwarzfigurige Vasenmalerei II. Ausserattisch. In: Der Neue Pauly (DNP). Band 11, Metzler, Stuttgart 2001, ISBN 3-476-01481-9, Sp. 276–281. ; John Boardman: Early Greek Vase Painting, Thames and Hudson, London 1998, p. 150. ↑ On Caeretan hydriai see Rolf Hurschmann: Caeretaner Hydrien. In: Der Neue Pauly (DNP). Band 2, Metzler, Stuttgart 1997, ISBN 3-476-01472-X, Sp. 907–908. 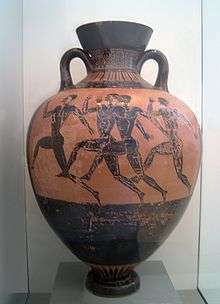 ; John Boardman: Early Greek Vase Painting, Thames and Hudson, London 1998, pp. 219–223; Thomas Mannack: Griechische Vasenmalerei. Theiss, Stuttgart 2002, S. 132f. ↑ On Pontic vase painting see Matthias Steinhart: Pontische Vasenmalerei. In: Der Neue Pauly (DNP). Band 10, Metzler, Stuttgart 2001, ISBN 3-476-01480-0, Sp. 138–139. ; Thomas Mannack: Griechische Vasenmalerei. Theiss, Stuttgart 2002, S. 133; John Boardman: Early Greek Vase Painting, Thames and Hudson, London 1998, pp. 219–223. ↑ On Etruscan vase painting see Matthias Steinhart: Schwarzfigurige Vasenmalerei II. Ausserattisch. In: Der Neue Pauly (DNP). Band 11, Metzler, Stuttgart 2001, ISBN 3-476-01481-9, Sp. 276–281. 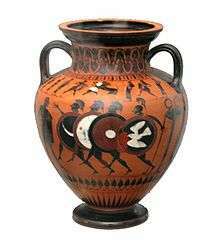 ; John Boardman: Early Greek Vase Painting, Thames and Hudson, London 1998, pp. 219–223. ↑ On Chalcidian vase painting see Matthias Steinhart: Chalkidische Vasenmalerei. In: Der Neue Pauly (DNP). Band 2, Metzler, Stuttgart 1997, ISBN 3-476-01472-X, Sp. 1088–1089. ; Thomas Mannack: Griechische Vasenmalerei. Theiss, Stuttgart 2002, S. 129–131; John Boardman: Early Greek Vase Painting, Thames and Hudson, London 1998, pp. 217–219. ↑ On Pseudo-Chalkidischen pottery see Thomas Mannack: Griechische Vasenmalerei. Theiss, Stuttgart 2002, S. 131; Matthias Steinhart: Pseudochalkidische Vasenmalerei. In: Der Neue Pauly (DNP). Band 10, Metzler, Stuttgart 2001, ISBN 3-476-01480-0, Sp. 516–517. 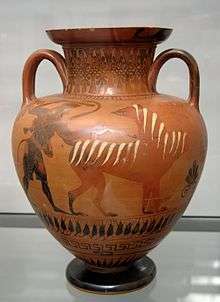 ; John Boardman: Early Greek Vase Painting, Thames and Hudson, London 1998, pp. 217–219. ↑ On the Northampton Group, the Group of Campana Dinoi and Campana hydriai see Matthias Steinhart: Schwarzfigurige Vasenmalerei II. Ausserattisch. In: Der Neue Pauly (DNP). Band 11, Metzler, Stuttgart 2001, ISBN 3-476-01481-9, Sp. 276–281. ; John Boardman: Early Greek Vase Painting, Thames and Hudson, London 1998, p. 220; Thomas Mannack: Griechische Vasenmalerei. Eine Einführung. Theiss, Stuttgart 2002, S. 132. ↑ On Etruscan pottery siehe Matthias Steinhart: Schwarzfigurige Vasenmalerei II. Ausserattisch. In: Der Neue Pauly (DNP). Band 11, Metzler, Stuttgart 2001, ISBN 3-476-01481-9, Sp. 276–281. ; John Boardman: Early Greek Vase Painting., Thames and Hudson, London 1998, p. 219–223. ↑ Thomas Mannack: Griechische Vasenmalerei, S. 17. ↑ Thomas Mannack: Griechische Vasenmalerei, S. 18. ↑ John Boardman: Schwarzfigurige Vasen aus Athen, S. 7f. ; Thomas Mannack: Griechische Vasenmalerei, S. 18f. ↑ On Corinthian ceramics research for the archaic period see the summary in Christiane Dehl-von Kaenel: Die archaische Keramik aus dem Malophoros-Heiligtum in Selinunt, Staatliche Museen zu Berlin, Berlin 1995, S. 22–31, ISBN 3-88609-371-9. ↑ Thomas Mannack: Griechische Vasenmalerei. Theiss, Stuttgart 2002, S. 125–128. ↑ Thomas Mannack: Griechische Vasenmalerei. Theiss, Stuttgart 2002, S. 129–133.